NIGEL TAYLOR – a man suffering with cataracts, hearing difficulties, diabetes and deformed feet – remembers the moment clearly. It was not an isolated incident for the 53-year-old and yesterday he spoke out in support of the latest campaign to fight the abuse the disabled, gays, lesbian and minorities face all too often. Mr Taylor is a representative of disabled self-advocacy group My Life My Choice and doesn’t want others to suffer as he has. Brenda Churchill, 65, from Witney has a heart condition, diabetes and suffers from osteoarthritis which means she cannot walk. She is also a town councillor for the town but says she is also treated poorly by inconsiderate members of the public. She said: “I get a lot of abuse when I am out on my scooter. People are oblivious to you being there. Now the pair are backing the launch of a new hotline for hate crime victims. A hate crime is verbal or physical attacks based on a person’s disability, gender-identity, race, religion or faith and sexual orientation. The number of such offences reported in the city has declined in the past three years. From April to September, 64 hate crimes were reported in Oxford compared to 73 and 104 in 2011 and 2010 respectively. And the detection rate was 65 per cent this year compared to about 40 per cent in the previous two years. But Thames Valley Police chief inspector Hugh Matthews said the force believes that, given the nature of the offence, as many as eight out of 10 hate crimes go unreported. He said: “There is a range of reasons why people may not feel comfortable or able to contact the police. The new hotline, launched in Oxford yesterday, comes four years after Thames Valley Police launched a campaign calling for “silent victims” of domestic, racial and homophobic crimes to come forward. 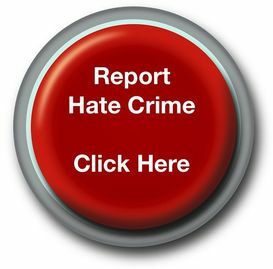 The police and authorities in the council have provided 12 month’s funding of £10,462 for the hotline service, run by the charity StopHateUK. Mr Taylor, from Banbury, said: “I think this new line is going to be really useful. I have been so impressed by the commitment to it. 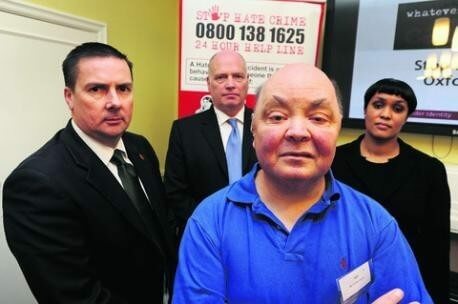 StopHateUK chief executive Rose Simkin said race and disability attacks were the most common. The move was welcomed by Cheryl Briggs, chairman of the Oxfordshire Homophobic Awareness Liaison Team. Its latest annual members’ survey found 40 per cent of respondents, 48 people, had suffered verbal abuse. But just 10 per cent report it to the police while eight per cent reported to another agency. The remainder did not make a report. Call the helpline on 0800 138 1625.